Bailout: Gone With the Windbags? In reading CBO Director Peter Orszag's useful statement to the House Budget Committee about the bailout, I notice that the official name of the thing is the Troubled Asset Relief Act. Yes, its called TARA (a tribute to Ben Bernanke's southern roots, perhaps?). And now, it looks like the House Republicans are burning down Tara. Don't they realize that some people still haven't gotten over the last time? Update (9/29): In its latest incarnation, the bill is the Emergency Economic Stabilization Act of 2008, which establishes a "Troubled Assets Relief Program" or TARP. So, if the government borrows $700 billion for the bailout, let's say at 4.25% interest (a rate currently between the 10- and 30-year Treasury yield), taxpayers are on the hook for about $30 billion per year in interest. That adds roughly 1.1% to total federal spending, and is about $100 per person per year. The bailout shouldn't actually cost $700 billion - the Treasury will be buying assets that are presumably worth something. Exactly how much they will ultimately be worth is a matter of great uncertainty, and we don't know yet how exactly, in practice, the Treasury will determine what it is willing to pay (i.e., how hard it will try to get a good deal). So, the $700 billion is an upper bound on the cost (unless, of course, they ask for more....). That is about 5% of GDP. If we guesstimate (conservatively, I hope) that the full $700 billion is spent, and the Treasury loses 50%, we're talking 2.5% of GDP. So, the question is: in the absence of a bailout, would the additional, credit crunch-induced loss of output be larger than 2.5% of a year's GDP? Hat tip to Ezra Klein, who says: "The question was simple. The answer came from some dreamscape I've never visited." The Journal's Real Time Economics has the "agreement on principles" from the Congressional negotiations over the bailout package. The Congress also wants limits on executive compensation and efforts to facilitate mortgage restructuring instead of foreclosures. They also are only willing to make $250 billion available immediately (though $700 billion remains "authorized"). Via Mankiw, a defense of the Paulson plan. Willem Buiter says its "a useful first step," and he's not a fan of the changes apparently being made by Congress. In the Washington Post, James Galbraith argues for using the traditional mechanisms for protecting the banking sector instead. Meanwhile Post columnist David Ignatius is asking the right question: WWJMKD? Sure sounds like blank check. The price at which the illiquid assets will be acquired by the TAD will be crucial for its effect on future bank behaviour. Prices should be higher than what the banks that own these assets now can obtain in the market, but as far below their fundamental value as is consistent with the survival of these banks. This is both to protect the tax payer and to create the right incentives for future risk taking by the banks. Punitive pricing is therefore essential. If the banks and their shareholders don’t complain loudly about expropriation through under-pricing, then prices are too high. Since those managing the agency are unlikely to have much of a clue about the fundamental value of these illiquid assets, the TAD should arrange reverse auctions as price discovery mechanism. I recommend a reverse Dutch auction as a particularly effective mechanism to transfer value from the banks to the tax payers. Here’s the thing: historically, financial system rescues have involved seizing the troubled institutions and guaranteeing their debts; only after that did the government try to repackage and sell their assets. The feds took over S&Ls first, protecting their depositors, then transferred their bad assets to the RTC. The Swedes took over troubled banks, again protecting their depositors, before transferring their assets to their equivalent institutions. The Treasury plan, by contrast, looks like an attempt to restore confidence in the financial system — that is, convince creditors of troubled institutions that everything’s OK — simply by buying assets off these institutions. This will only work if the prices Treasury pays are much higher than current market prices; that, in turn, can only be true either if this is mainly a liquidity problem — which seems doubtful — or if Treasury is going to be paying a huge premium, in effect throwing taxpayers’ money at the financial world. Within hours of the Treasury announcement Friday, economists had proposed preferable alternatives. Their core insight is that it is better to boost the banking system by increasing its capital than by reducing its loans. Given a fatter capital cushion, banks would have time to dispose of the bad loans in an orderly fashion. Taxpayers would be spared the experience of wandering into a bad-loan bazaar and being ripped off by every merchant. Raghuram Rajan and Luigi Zingales of the University of Chicago suggest ways to force the banks to raise capital without tapping the taxpayers. First, the government should tell banks to cancel all dividend payments. Banks don't do that on their own because it would signal weakness; if everyone knows the dividend has been canceled because of a government rule, the signaling issue would be removed. Second, the government should tell all healthy banks to issue new equity. Again, banks resist doing this because they don't want to signal weakness and they don't want to dilute existing shareholders. A government order could cut through these obstacles. Meanwhile, Charles Calomiris of Columbia University and Douglas Elmendorf of the Brookings Institution have offered versions of another idea. The government should help not by buying banks' bad loans but by buying equity stakes in the banks themselves. Whereas it's horribly complicated to value bad loans, banks have share prices you can look up in seconds, so government could inject capital into banks quickly and at a fair level. The share prices of banks that recovered would rise, compensating taxpayers for losses on their stakes in the banks that eventually went under. Krugman comes to a similar conclusion. Here is Calomiris' FT piece. Also, Peter Baker profiles Paulson and Bernanke: could the "'The Hammer' and 'Helicopter Ben'" be buddy movie? The present financial crisis has prompted widespread recognition of the need for better regulation of the financial system. Even the Republican nominee is currently claiming to be for it (before, he was against it). "Modern History's Greatest Regulatory Failure," says Clinton-era Treasury official Roger Altman. While excessive zeal for deregulation is a prototypically Republican failing, it should be noted the Clinton administration was hardly immune to the zeitgeist, as this example from John Judis of the New Republic reminds us (though David Blake pins the blame on a certain Rand-ite erstwhile Fed "Maestro"). Enough to go around, I suppose. Overall, 59 percent of our economists say Obama would be best for the economy long term, with 31 percent picking McCain, and 8 percent saying there would be no difference. That's according to Scott "Dilbert" Adams, who commissioned a survey of over 500 American Economic Association members. No word on who economists thought would be best for the economy short term (since in the long run, we're all dead, of course). Hat tip: Mankiw. SQUINT hard, and textbook publishers can look a lot like drug makers. They both make money from doing obvious good — healing, educating — and they both have customers who may be willing to sacrifice their last pennies to buy what these companies are selling. It is that fact that can suddenly turn the good guys into bad guys, especially when the prices they charge are compared with generic drugs or ordinary books. A final similarity, in the words of R. Preston McAfee, an economics professor at Cal Tech, is that both textbook publishers and drug makers benefit from the problem of “moral hazards” — that is, the doctor who prescribes medication and the professor who requires a textbook don’t have to bear the cost and thus usually don’t think twice about it. In protest of what he says are textbooks’ intolerably high prices — and the dumbing down of their content to appeal to the widest possible market — Professor McAfee has put his introductory economics textbook online free. He says he most likely could have earned a $100,000 advance on the book had he gone the traditional publishing route, and it would have had a list price approaching $200. He's right. I have moved away from using a textbook for macro principles and I sometimes fantasize about ditching them altogether. It is not clear what Prof. McAfee himself is maximizing; his behavior seems to be maximizing social rather than personal welfare... He is acting suspiciously like the "social planner" we periodically encounter in economic theory. And not for the first time - see this earlier post on his attempt to fix the academic publishing process. Four people were arrested during a gathering that drew thousands Monday night to protest Miami University's decision to hold classes Tuesday. The protest outside of Miami President David Hodge's home drew an estimated 3,000 and agencies throughout Butler County — including nearly 70 officers — were called in to assist, according to the Oxford Police Department. Butler County Sheriff Richard K. Jones said he was disappointed to hear about the protests Monday night "because there are people out there really suffering." "I have a place for them to stay that does have electricity, and I will make room for them," Jones said referring to the Butler County Jail. "We don't have time right now to deal with spoiled little kids." Update (9/17): To be fair, I should note that none of my colleagues who are teaching undergrads this semester have reported any power outage-related whining or excuse-making. CBO estimates that the deficit for 2008 will be $407 billion, substantially higher than last year’s $161 billion. As a share of the economy, the deficit is projected to rise to 2.9 percent of GDP this year, up from 1.2 percent of GDP in 2007. That 1.7 percentage point increase as a share of GDP is roughly evenly split between a 0.9 percentage point decline in revenue relative to GDP (reflecting the impact of lower corporate tax revenue and the rebates enacted as part of stimulus legislation this year) and a 0.8 percentage point increase in spending relative to GDP. 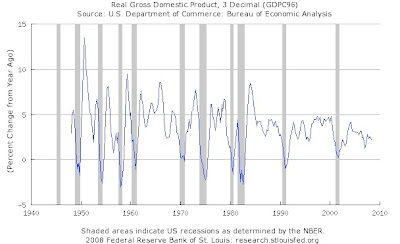 As a share of GDP, that is not as bad as the Reagan-era deficits (which peaked at 6% of GDP in 1983). Including the $184 billion borrowing from the social security trust fund (i.e. 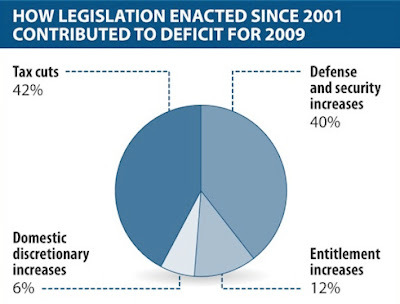 the "on-budget" deficit), the 2008 deficit is $592 billion, or 4.2% of GDP. Of course, that's a significant deterioration from the picture eight years ago - remember when we thought the problem would be what to do with all those surpluses? What happened? Comparing the CBO's most recent forecast for 2009 with the one it made in January 2001, the Center on Budget and Policy Priorities made this breakdown: According to the CBPP, the total deterioration of the fiscal picture is $1.256 trillion; the chart is based on the parts due to tax and spending policy ($1 trillion), and doesn't include the $256 billion due to the economic slowdown. (Hat tip: Ezra Klein). The NY Times' Dealbook reports on the latest measure to address the credit crunch, from Krispy Kreme. The Justice Department laid out a broad policy on antitrust enforcement on Monday that drew an unusually sharp rebuke from three federal trade commissioners, who said it would protect monopolies from prosecution. A 215-page report from the Justice Department, coming after nearly a year of public hearings, was originally meant to lay out a governmentwide approach to combating anticompetitive business practices. Instead, it exposed a rift between the Justice Department and the Federal Trade Commission over whether the government was protecting consumers or big businesses. [T]his is an odd slowdown, by historical norms: no clear decline in GDP, no months of 6-digit job losses. Instead, the economy is being slowly ground down. What I suspect, however, is that this is what the 21st-century business cycle looks like. The sharp slumps of the past partly reflected an inflation-prone environment, in which the Fed occasionally had to slam on the brakes; it also reflected a mainly goods-producing economy, with lots of inventories, in which recessions had a lot to do with inventory adjustments. Not really, but I should point out that Martin Feldstein and John Taylor, eminent economists both, make the case for McCain's tax proposals in the WSJ. Some debunking here. See also the Tax Policy Center's study. Also, Feldstein and Taylor recycle the misleading claim about the US corporate tax rate being the "second highest among all industrial countries," which is debunked here. While the G.D.P. has continued to rise, wages have stagnated, pensions have shrunk or disappeared and income inequality has increased. Other shortcomings have become apparent. The boom in prison construction, for example, has added greatly to the G.D.P., but the damage from the crimes that made the prisons necessary is not subtracted. Neither is environmental damage nor depleted forests, although lumbering shows up in government statistics as value added. So does health care, which is measured by the money spent, not by improvements in people’s health. Obesity is on the rise in America, undermining health, but that is not subtracted. Those are some of the bigger issues, but last week's upward revision of the second-quarter growth rate up to 3.3% (from 1.9%) illustrated the disconnect that sometimes exists between economic statistics and perceptions in the short run. At Econbrowser, Menzie Chinn looked into the numbers, asking "why does it feel like recession?" As he notes, much of the growth is coming from net exports (i.e., NX in the equation GDP = C + I + G + NX); with both increasing exports and decreasing imports. That is, in part, the declining dollar at work... the price deflator for exports rose at a 10.9% rate, and import prices were rising at a 28.5% pace (!! ; the second quarter included a big run-up in oil prices, which has since partly reversed...). Hence a divergence between inflation for gross domestic purchases (C+I+G), at 4.2% and overall (GDP deflator) inflation of 1.2%. The news on output growth was too good to be credible for some - the conspiracy theories appear to focus on the deflator calculations. 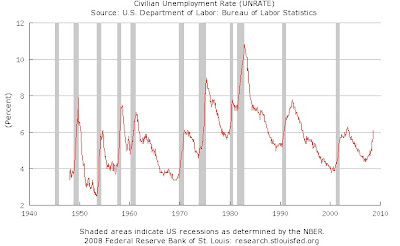 Devotees of Okun's law will note that a 3.3% real GDP growth rate does not appear consistent with unemployment rising from 5.1% to 5.5% during the quarter. Update (9/3): Macroblog on the deflator issue.